Happy New Year! Now that 2016 is gone (thank goodness), we at Haymeadow Apartments and GRE Property Management are offering new renters a way to save $1200 in 2017! 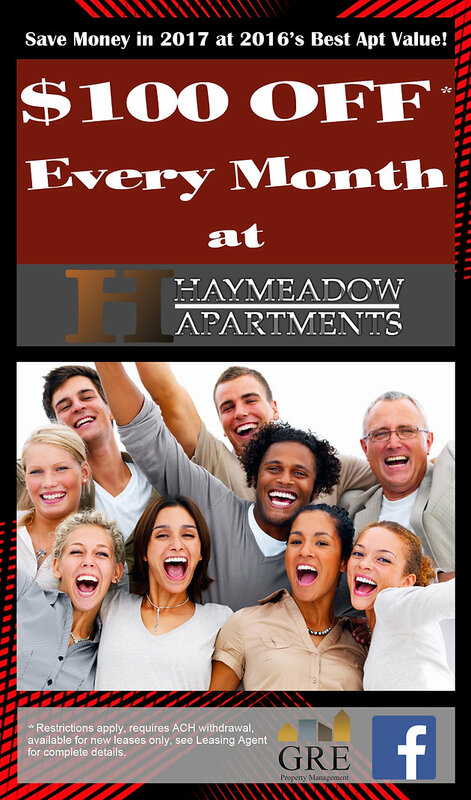 For a limited very time only, when you sign a new lease you can rent your 1 or 2 bedroom apartment at Haymeadow for $100 off every month! So a unit that may have been renting for $679, would now be available for $579 a month!What will you do with $1200 you save?